Ok...so I've been reading all these crazy challenge stories and I just get so inspired! I've been wanting to try a Black Widow challenge since Sims 2...but could never bring myself to do it. - Age up early allowed on Toddlers with 3 in each skill, Children with A's, and Teens with A's. Babies age up naturally OR on their birthday. Here we go! Enjoy and Happy Simming! Last edited by dbars107 on January 30th, 2018, 7:45 am, edited 8 times in total. Two new chapters are up! mojot89 wrote: I see you're becoming like me and becoming a challenge addict! Reading this is on my to do list for tomorrow! Just finished reading and I love it! The death dungeon is great! lol! I really like your concept and wish I had thought of that! lol! What do you do with the urns and tombstones? mojot89 wrote: Just finished reading and I love it! I wish I'd thought of your Glassbolt idea, lol! Love this! Very funny, yet twisted at the same time lol! simfulicious wrote: Love this! Very funny, yet twisted at the same time lol! Thanks for reading! I'm having fun in a twisted sort of way, lol. I normally avoid the "evil" trait like the plague so this is a new experience for me completely. I'm glad you're enjoying it! 3 new chapters are up! I really love this! Maybe it's the sadistic side of me that likes the idea of the challenge, I don't know. 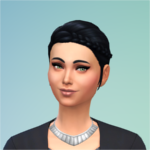 Your founder is gorgeous and she makes me want to play the sims 4 again! All of your young kids are giving me hives lmao! I love toddlers so much in TS2 & TS4 but having so many, and multiples of them as well, is honestly a nightmare for me! I wish you the best of luck in raising them LMAO! graymondaysleep wrote: Happy new years!! So. Many. Birthdays. well at least that is over! lol do you have the good schools lot trait? That will help with them getting good grades and aging up early. 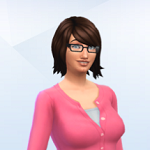 In my 100 baby challenge, it only took two days for my kids to get A's right after aging up. love.love.love! Your sarcastic humor is THE BEST! And if Scarlet can't beat them, she might as well join them! (in reference to the dollhouse). I do not have that trait on...I will when I go back in game though, lol. Thanks for the tip! Also...the covered deck has the side entrance that is for household (and butler) only I had to leave the gate to the deck unlocked so Actual guests can get in there, lol. 7 teen birthdays (4 immediately because 4 A's) and then YA's. Whee! !